Why learn to draw Kanji? In the era smartphones and computers, is it still worth it to learn how to draw kanji i.e. Japanese handwriting? Nowadays even native Japanese speakers are having a hard time maintaining their handwriting skills. Why should a Japanese learner bother with handwriting? There are actually several great reasons why you should learn Japanese handwriting in this day and age. Being able to write kanji by hand from memory feels like being able to cast magic spells, and it is! Being able to write out so many different characters by hand is literally magic. How the hell can our brains learn to do that?! It is tremendously rewarding to have a physical representation of our efforts. If you are trying to practice your writing skills by typing out in a laptop or your phone, you won’t get the same reward as having a physical notebook filled with the squiggly magic of Kanji. Kanji that are made from your own sweat and tears. To boost memory and enhance your learning abilities. Several scientific studies have show that writing by hand leads to better learning outcomes and improved cognitive abilities. To your Japanese sweetheart and to your Japanese friends! In Japan it is customary to write hand written notes for the new year (年賀状) and other events. You don’t want to miss out in these cultural events! Hopefully I have now given you at least some interest into learning how to write kanji. Now let’s cover some common pitfalls and mistakes to save you time! This technique, known as rote memorization, is quite ineffective for memorization. Although writing the same kanji over and over can perhaps improve how beautifully you can write kanji, its effect on memory will be nil compared to using mnemonics and other more systematized approaches. Do not strictly follow the learning order set by your textbook, your teacher or the order set by Japanese schools for Japanese children. Usually, most textbooks and schools will teach you kanji in a similar order to that which is used in Japanese schools. This approach has the benefit that you will be able to write and recognize some of the most common kanji. Being able to write and recognize some of the most basic kanji, such as 食 for the word 食べる (to eat), is extremely useful, especially if you are living in Japan. However, this approach has the downside that you will start out by learning some fairly complex kanji (strokes wise). For example, the kanji for week 曜 is taught fairly early on, a kanji which for some beginners might look like a undecipherable mass of squiggles. The other downside is that you will be learning kanji that are not very similar to each other. Learning kanji that are similar to each other is extremely useful. Kanji are not random pictures unrelated to each other. They are actually made up of smaller components and even other simpler kanji. Once you learn the basic constructs that make up kanji, the radicals, it is much easier to remember kanji. For example, once you learn the kanji for sun 日 and the kanji for mouth口, then learning the kanji 唱 becomes a breeze. This is because you can remember 唱 by remembering that it is made up of two suns and a mouth. So in which order should you learn kanji? In which order should I learn Kanji? I think it is better to strike a balance and do a combination of all the methods. Learn some kanji from your textbook, learn some kanji based on how related they are related to each other and most importantly of all, learn kanji that you naturally encounter while reading or trying to write something in Japanese. Do not skip this! Each kanji should be written in a specific order, this order is called the stroke order. It may seem as an unnecessary layer of complexity at first, but stroke order will actually make it much easier to learn kanji. Previously, I mentioned how kanji are not random squiggles, they are actually made up of basic units. The same principle carries over for stroke orders, they are systematic. After some practice, stroke order will become intuitive, something your brain does automatically and that you can not explain. 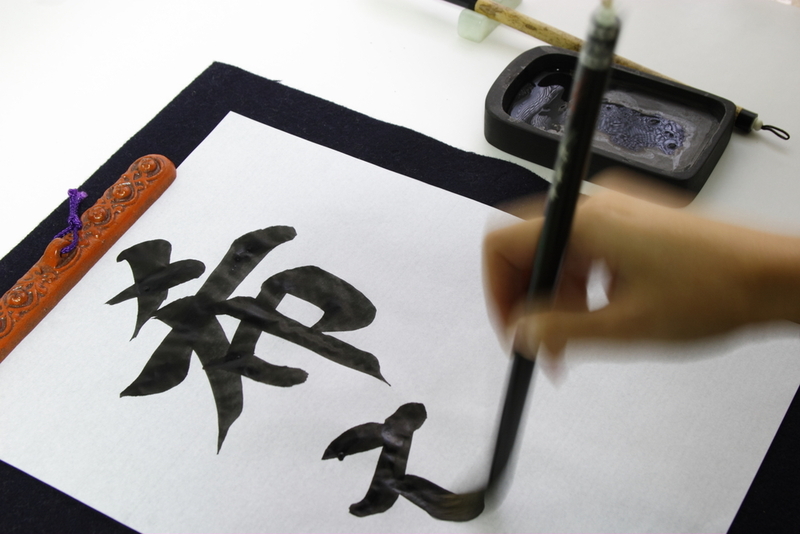 That intuition will guide you when writing kanji so that even if you think you forgot how to write a character, once you start writing it, the rest will flow out your hand like magic. Pay at least some attention to stroke endings. What are stroke endings? That is how you finish writing the strokes in kanji. There are three options, a full stop, a sweep, or a “jump” movement. Nowadays most people write with pencils and pens instead of traditional brushes or 筆ペン(fudepen), so stroke endings are barely noticeable. Nonetheless, I think that learning stroke endings is well worth it since learning them only requires a minimal time investment. I only practiced these at my beginning stages of learning kanji and now, just just like with stroke order, it is something I do automatically by intuition. Start out with simply learning how to write hiragana and katana by hand if you haven’t yet! P.S. Hiragana and katakana are actually derived from kanji. Try out a learning program based on mnemonics such as Heisig’s Remembering the Kanji A Complete Course on How Not to Forget the Meaning and Writing of Japanese Characters. Heisigs’s Remembering the Kanji teaches you how to write and remember over 2200 kanji, including all of the 常用漢字 (jyoyou kanji), a list of 2,136 characters considered a baseline knowledge of kanji for those who finish compulsory education in Japan. The most important part of Heisig’s Remembering the Kanji is that it will teach you how to remember kanji using mnemonics. Checkout this video to understand the power of mnemonics for learning kanji! Even if you don’t finish studying the whole book, the practice it will give you into learning radicals and mnemonics to learn kanji will give you a massive boost for all of your future kanji learning endeavors. I am partial to Heisig’s, because I have been using his method for years and because he stresses the importance of handwriting in his book. Look up kanji information and writing guides. Use Jisho.org or Kanij Alive to look up kanji information and writing guides. Jisho is great online Japanese dictionary that counts with kanji information. Kanji alive is solely focused on kanji. Its best features are that it shows kanji with beautiful fonts and great drawing animations. Also, it includes information on the origin of the kanji. This is perhaps the most important thing to do. What can you write? You could start a diary, or simply answer the reading comprehension questions from your textbook by hand. You can even prepare your daily to-do list in Japanese! That is something I actually do every day. Also, lately I have taken the practice of transcribing by hand YouTube videos that do not have subtitles. For some this might seem like some form of Chinese torture, but for me it is a lot of fun and it has the added benefit that you can get to practice your listening skills. Choose a YouTube video that you really love and then you will find yourself going back to your transcription to read it for fun, which acts as a natural form of spaced repetition. You can even add your own mini dictionary in your notes, for reference. 2. Get a beautiful notebook and simply write! Then show your notebook to a native Japanese speaker online or in person and get feedback. For starting out, its great to use a kanji notebook meant for Japanese school children. They have big blocks divided in four with grid lines, so that you can carefully write kanji like they appear on writing guides. 3. Get a nice Japanese pen with a fine tip. This will help you a lot when writing kanji with tons of strokes. I personally use these Uni pens. 4. Take a moment to appreciate how much fun it is to actually be able to write Japanese. I am Gabriel and I develop Koipun, Japanese learning website. At Koipun you can learn about how to learn Japanese, through our How I Learned Japanese interview series. You can also try Koipun Reader, a tool to help you save time while learning Japanese. Koipun Reader is still under development but you can checkout my technology preview.